Discount plan? Dental insurance? What’s the difference? If you’ve been to your dentist recently, you may have seen advertisements for an in-house dental plan or discount plan. 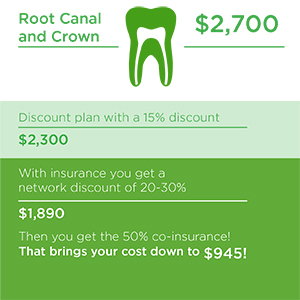 Are you wondering how that differs from your dental insurance? A member pays a full fee for a year of membership. The member then receives a discount on services performed by a participating dentist. Discounts may not be provided on all services a dentist performs. Fees vary from office to office. Normally, benefits are not applicable for specialty clinics (such as an endodontist or a periodontist). Most in-house dental plans do not offer nationwide coverage, so be wary if you are a snowbird or frequent traveler. Have the option to pay annually or monthly – whichever is more convenient. Receive a network discount on services, with an average discount of 20-30%, and co-insurance coverage. Enjoy coverage for “just in case” items, like a root canal or a filling. Have coverage at both general dentist offices and specialty clinics. Have access to 90% of Minnesota dentists as part of Delta Dental of Minnesota’s networks. Don’t have to worry about paying your dentist – payments are made directly to an in-network dentist by Delta Dental of Minnesota.